Little did Kaylan Mahomes know when she tweeted a selfie of her twin, Kyla, and their mum, that she would send the Internet hive mind spiralling into utter bewilderment. 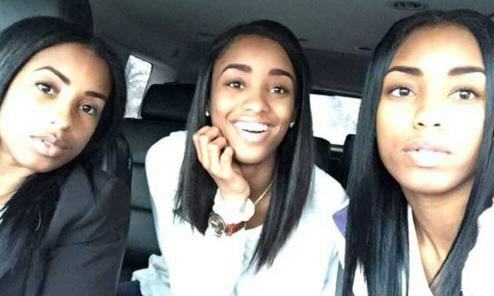 The tweet by the teenager read, ‘Mom, twin and me’ but, as all three share the same youthful glow, it ended up looking like a picture of triplets which obviously left everyone trying to guess who was who. Since being posted on January 28, the photo has been retweeted more than 28,000 times and has received more than 50,000 likes. After seeing how well received their first selfie was, the family, who live Indiana, U.S., created an Instagram page to share more images of themselves. When your mom thinks it’s a picture..lol #whosthemom ?? The post is a video of one of the ladies holding a camera while the three hold still for a picture. The three then burst into laughter when one of them apparently realises she was actually being videoed. We can’t help but notice that the lady on the left looks pretty similar to the lady in the black blazer in the photo. Could she be the mum? Someone please help, because social media users aren’t! WATCH NOW: FOX59 MORNING NEWS AT SEVEN FOX59 TV SCHEDULE SEARCH CONTACT US Fox 59 NEWS MORNING COMMUNITY TRAFFIC ON-AIR SPORTS HEALTHTRAX CLOSINGS/DELAYS WEATHER 21° Viral photo of Indianapolis family has Internet wondering: Which one is the mom?